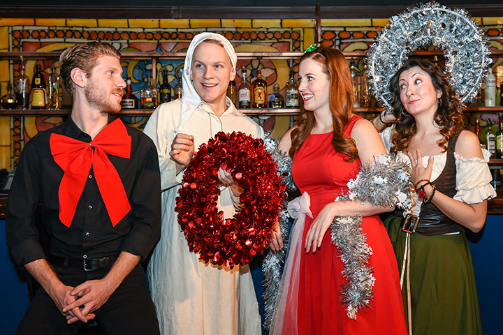 Lee Cortopassi, Andrew Orsie, Jillian Kuhl, and Kate Hoover in The Imbible: Christmas Carol Cocktails. Photo by Russ Rowland. BOTTOM LINE: A fun cabaret style show, infused with a cappella melodies, that follows the newly enlightened Ebenezer Scrooge as he learns what drinks he’ll need to mix in order to host a successful holiday party. This is a highly entertaining show for tourists and New York City residents alike. It not only introduces the audience to the history of alcoholic holiday beverages (while providing them with samples to imbibe), it also promises laughter and skillfully crafted harmonies sung by talented performers...and alcoholic beverages...did I mention alcoholic beverages? The show picks up where Dickens’s A Christmas Carol left off, finding Scrooge (played joyously and delightfully by Andrew Orsie) in his enlightened and much happier state. Deciding to throw a holiday party, Scrooge summons the spirits to help him learn how to prepare the right...spirits...for drinking. Jake Barley, the non-Equity, actor-bartender version of Jacob Marley (played by Lee Cortopassi), heralds the three spirits of Christmas who walk Ebenezer through the history and creation of three very different holiday cocktails. To start off the imbibing, the audience is given an in-depth history lesson on the origin of posset and egg nog, while also learning about and sipping on a Brandy Syllabub. Kate Hoover as the character Brandy lays down a whole lot of knowledge in such an engaging manner that the history lesson is thoroughly enjoyable. Hoover is excellent throughout, both in her captivating performing and adept singing. An audience volunteer (or two) helps to make each of the drinks, and all of the actors in turn engage in witty banter with their assistants from the audience. The next cocktail on the menu is the Drambuie Mocha. The storyline leading up to the making of this drink may not have been quite as memorable, but an alcoholic coffee, chocolate, and scotch liqueur beverage is sure to please. Plus, the audience participation is consistently a hit, and Jillian Kuhl (as Islay) deftly navigated the interaction with her feisty audience participant. The final part of the story presents an intriguing science lesson, complete with a live laboratory demonstration that produces the alcohol-infused globular solids which form a molecular candy cane martini. With a science background, an audience member can particularly appreciate the chemistry behind the creation of the colorful precipitate; without a science background, the chemical process is still interesting and magical, producing a minty alcoholic snack. This segues into a karaoke version of "The Twelve Days of Christmas" that has the whole house singing. The company brings the show full circle with an expertly arranged holiday carol medley that shows off the musical direction and vocal talents while sending everyone off in a holiday spirit. The cast breaks the fourth wall efficiently and effectively, proving themselves to be particularly strong with audience interaction. Cortopassi handily injects a healthy dose of entertainment industry humor that is spot on for those of us familiar with the NYC theatre scene, but also interesting and funny for the many out-of-towners in the audience who are by now quite familiar with the plight of the New York actor from various movies and TV shows. The costumes are fun and festive (Cortopassi’s deadpan cow being one of the biggest laughs of the show), and the lighting is well adapted to the space. The set is minimal, but the props and special costume additions are interesting, entertaining, and comedic. The harmonies are tightest when the performers are close to each other, proving that singing challenging harmonic arrangements from across the room is not an easy feat. For the most part, the cast rose to the occasion admirably, but there were certainly moments when I wished they had been next to each other to minimize the effort it took them to hear each other. 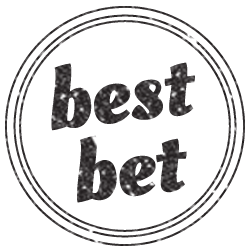 It’s hard to beat a show that entertains, educates, and inebriates. Plus, there’s a bar in the room for anyone who needs an extra beverage or three before or even during the show. The drinks provide a range of options for diverse tastes; my only criticism would be that all three are very sweet and potentially hard to finish. If your goal in attending this show is to get drunk, you may be disappointed, but honestly, that shouldn’t be your reason for seeing it. The music, the performances, the comedy, and the audience interaction are what make this show great. The Imbible: Christmas Carol Cocktails was conceived by Anthony Caporale and directed by Anthony Caporale and Nicole DiMattei. It features Original Musical Arrangements and Musical Direction by Josh Ehrlich, with Book and New Lyrics by Anthony Caporale. Characters are loosely based on A Christmas Carol by Charles Dickens. The show is produced by Broadway Theatre Studio. The cast includes Andrew Orsie as Ebenezer Scrooge, Lee Cortopassi as Jake Barley, Kate Hoover as Brandy, and Jillian Kuhl as Islay. Alternates: Nicole DiMattei as Brandy and Ellen Cheney as Islay.